Book 4 in The Medoran Chronicles: Who will live and who will die? Now that Aven Dalmarta sits upon the throne of Meya, Alex is in a race against the clock to save the mortals of Medora from the Rebel Prince’s wrath. Guided by a haunting and unspeakable vision of the future, Alex and her friends must warn the mortal races. But making new allies out of old enemies proves difficult. Under the guidance of a mysterious mentor, Alex learns to strengthen her gift to fight the challenges she now faces. But in a world where nothing is certain, Alex is sure of only one thing: Aven is coming. The Medoran Chronicles by Lynette Noni has been described as ‘a game changer’ in YA fiction. A page-turning fantasy series about friendship, finding yourself and the ultimate battle of good versus evil, The Medoran Chronicles is perfect for fans of Sarah J. Maas and Rick Riordan. Building to a stunning climax, with shocking twists and devastating losses, Graevale is an unforgettable read. In her third year at Akarnae Academy for the gifted, Alexandra Jennings knows now more than ever that there is danger looming. This is the fourth book in the best-selling Medoran Chronicles series. I have gotten teary eyed over books before but I have never sobbed. This book broke my heart and I cried so hard it was ridiculous. So obviously I needed to share the pain with someone and got my mum into the series so we could cry together! So much heartache in this book but it just made me love the series that much more, because it felt so real! Impressive and had me laughing crying and feeling the roller coast ride of the story excellent. Can’t wait for the next book. Recommend this to anyone of any age. I love the niyx characters and all the other ones. I feel part of the story it’s always hard to finish a book and it’s all over. I bought this series for my Son and couldn’t put it down. I can’t wait for the final book to be released. 5.0 out of 5 starsmost Medoran book yet! 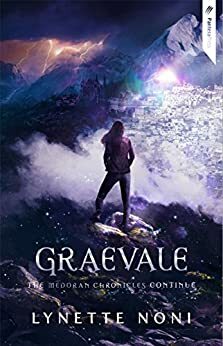 this was the most Medoran book yet, the author Lynette Noni has hit the sweet spot in Graevale book 4 in the Medoran Chronicles. I can not wait until her next art work of words come's out. Graevale is another amazing book by Lynette Noni! I had my head stuck in the book for a week, no one could get a word to me I was to raped up in this incredible book! It had we crying to the point I couldn't breath, laughing to the point it hurt, and sitting on the edge of my chair (literary) to the point I fell of twice! This is a wonderful book for all ages that will leave you speachless and like me falling of the edge of your chair!